THANK YOU to those of you that came out to help with some more bed prep yesterday! We spent most of the morning peeling back the tarp that had been covering the summer plot, which did a great job killing off some of the weeds there, might I add, hoeing up the lingering weeds, and moving wheelbarrow loads of compost and adding about an inch deep on top of the beds. We almost got all the beds covered, but there’s still a bit left to do, which I should be able to knock out by weekends end, in addition to adding some fertilizer. The summer veggies I’ve got going in the greenhouse are going to love it, I’m absolutely sure of it! After the beds are prepped, it’s just a matter of getting my new caterpillar tunnel installed, and getting them lovely plants in the ground. Though I have yet to harvest any of the spring crops (next week, I promise! ), my eyes are already starting to turn towards the summer, which, in case you didn’t know, is our longest growing season here in the sultry south. Get pumped! The spring crops have been doing a great job soaking up the rains we’ve had this past week, and now the forecast is clear and sunny and warming up for the foreseeable future, which is perfect, as the plants stretch their roots to the receding water table and soak up the coming rays of sunshine. Just as much as the veggies are loving the rain, so are the weeds! Next week will be filled with a lot of weeding and cultivation, I’m sure of it, but I’m confident in my new weed-management strategies and techniques, utilizing some of the tools I’ve invested in to manage the weeds, and am excited to really get this, what has been a problem for me in seasons gone by, under control, so I can give the veggies the best possible conditions to produce a high-quality, nutrient dense product for your enjoyment! Next week I know I’ll be able to start bringing some greens to the market, as well as putting them in my own salad bowl, and I can hardly wait. Stay tuned! I’m not sure if you’re aware, but there has been a huge egg recall in our wonderful state, with a lot of eggs being contaminated with salmonella. Here’s the issue as I see it… Eggs produced from unhappy chickens in confined animal feedlot operations (CAFOs, for short) are more susceptible to contamination both due to the often unsanitary living conditions these hens live in (think shelves of small cages where the hens can barely turn around, never seeing the light of day (sunshine is a great sterilizing agent, as well as being necessary to enact the proper hormonal regulation required for healthy egg production the bodies of the hens), being fed only grain, which their bodies aren’t designed to solely thrive on. They are stressed out, and therefore have to be supplemented with antibiotics in their feed to combat the diseases and pathogens that thrive in these inhumane living conditions), and the sheer quantity of eggs being processed and cleaned to send off to the packaging facilities, where they often sit for months before making their way to the shelves of the supermarket. In these operations, one bad egg can spoil the whole lot, and by the whole lot we’re talking beaucoup eggs, tens and hundreds of thousands of eggs. Did you know the eggs you get at the grocery store are on average 45 days old, and often upwards of 3 months old when you purchase them? Here’s where my girls eggs differ… I raise my hens in a woodlot setting (chickens are jungle-fowl, after all), where they spend their days running around freely, scratching and pecking for bugs and grubs and worms, munching on whatever greens they can find or tossed in their run after the market, supplemented with a non-GMO grain feed I get from Barrier Farms, which they grow not 10 miles from my farm. They live in a low-stress environment, spending their days doing chicken-things, which, in all honesty, you could get mesmerized watching them do for hours on end. My eggs are collected (almost) daily, and each one lovingly hand-washed, packaged, and refrigerated until I bring them to the market. I never sell eggs that are over 2 weeks old, no because of freshness, but because of limited storage, but also because I want you all to be able to enjoy what I’ve been enjoying for over two years now, the incredible taste of farm fresh eggs from happy chickens! You may have questions about the price of my eggs, complaining that it’s too high? 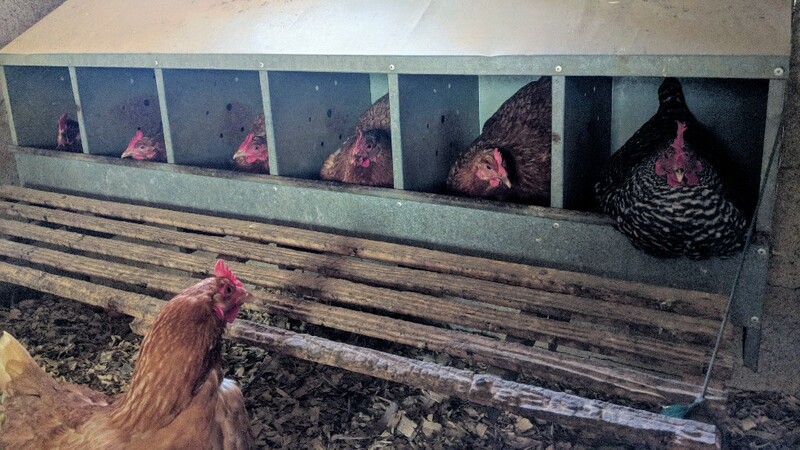 Well, I’ve crunched the numbers, and for the sake of transparency, my break-even on the eggs is $3.50/dozen, so at $5.00/dozen at the market, I’m making $1.50 profit, and that’s not even taking into consideration the 6+ months I’m feeding these ladies from the time I get them in the mail as day-old chicks to the time they stop free-loading and start laying. I’ll be frank with you, I have to make money doing this farming thing if I’m going to be able to do it, and, honestly, $5.00 is often less than you’ll spend for free-roaming, pasture-raised, non-GMO eggs that you’ll get at the market, and those eggs at the store are likely as old as the CAFO eggs you can purchase for pennies on the dollar. My girls are healthier for your bodies, with higher omega-3 fatty acids, a better ratio of omega-6 to omega-3 fatty acids, with harder shells and richer, tastier yolks. So, all that to say, support me, your farmer, and support my happy hens, and come get some eggs, with the confidence that my eggs won’t make you sick! I hope to see your shining faces at the Winecoff Farmer’s Market tomorrow morning from 9am til noon! 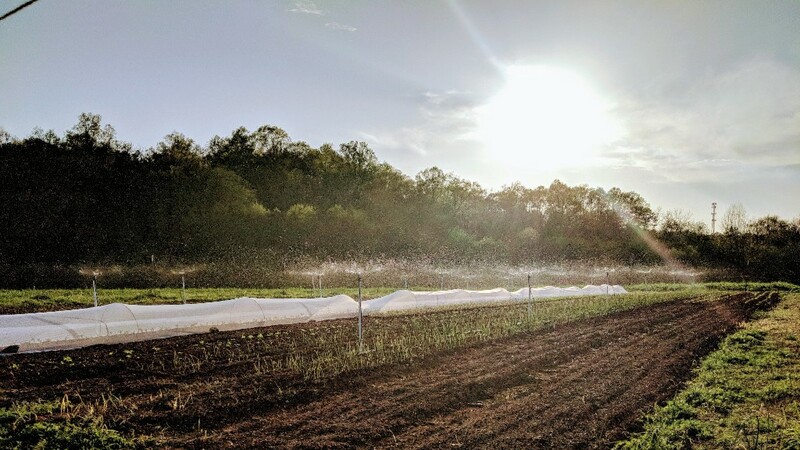 I’ll have pea shoots, radish shoots, sunflower shoots, kale shoots, and delicious, woodlot-raised, non-GMO eggs with me, as well as some eggplant and tomato starts that you can plant in your home gardens! Have a wonderful weekend, my lovelies, and I’ll revisit your inboxes next Friday! Be well!